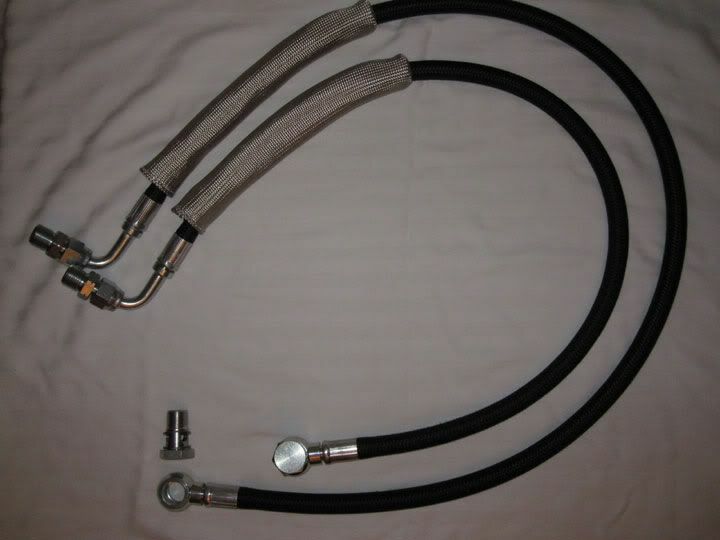 Im seeing if there is any interest in some custom made, by my own hands, hoses. I've spent some considerable time and money sourcing the correct parts and really like how the final product has turned out. As of now, the completed set is spoken for but I wanted to see if 5 people were interested in purchasing a set before I order more supplies. It wont quite be a group purchase because I would prefer to start small to ensure everything goes smoothly. We'll see how the initial run goes before I decide to make more than that. 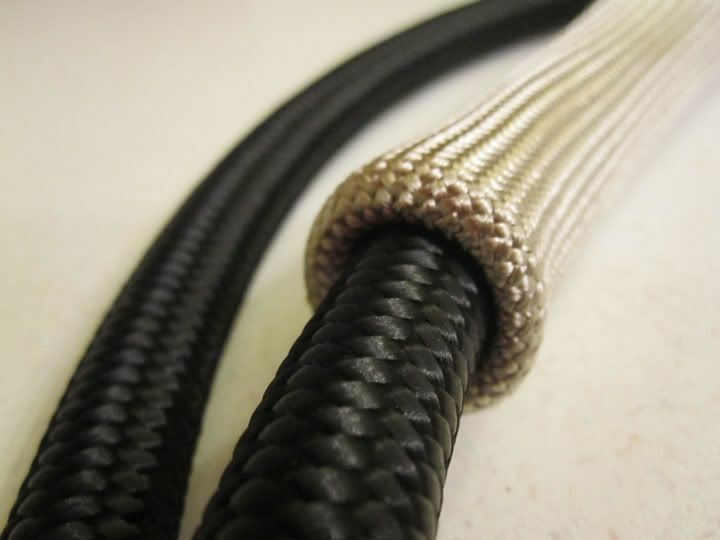 Some information about the hoses: From the pics you can see they are black nylon braided hose. 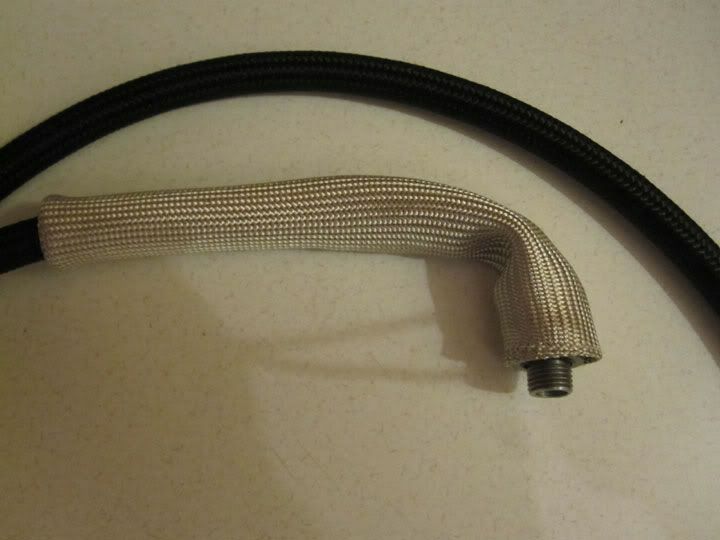 The hose quality is awesome. 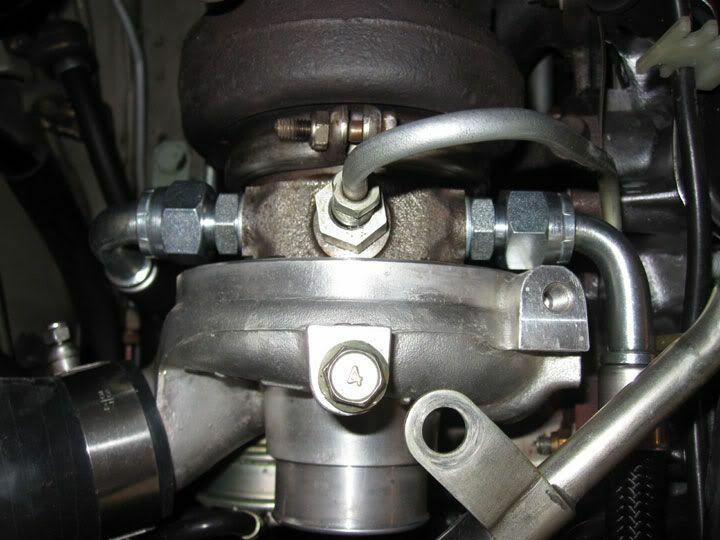 All of the fittings are industrial hydraulic fittings made of STEEL and not aluminum. The adapters are included and are also made of steel. Banjo bolts are new and include the crush washers. 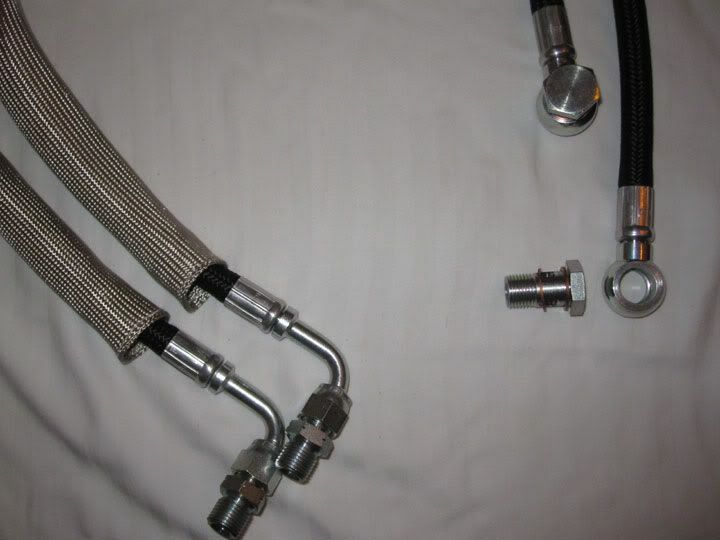 The hoses are professionally crimped for a clean look. 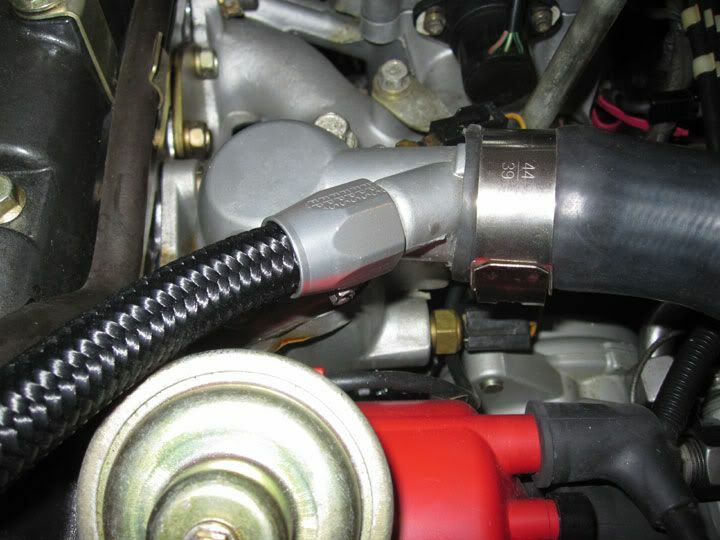 Finally, the hoses include a heat shield that will protect them since they sit directly under the exhaust manifold. I am flexible with what color boot you prefer although the silver ones pictured were 2" longer than the other colors. 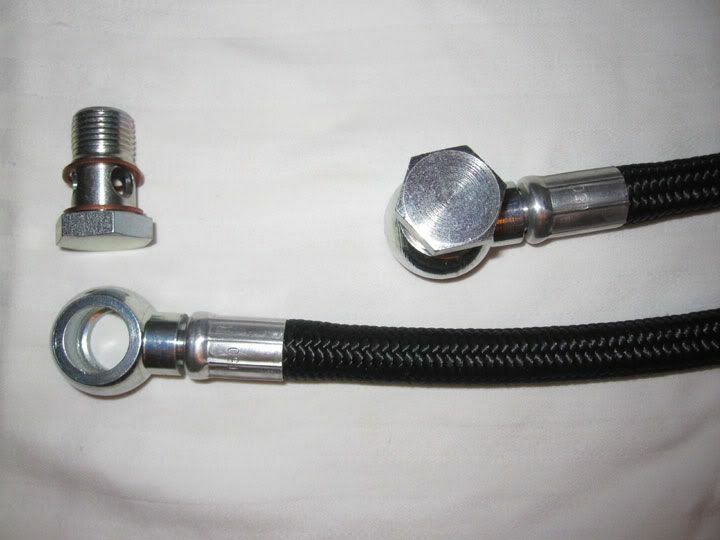 Some Advantages: These are a larger diameter than the stock hoses. 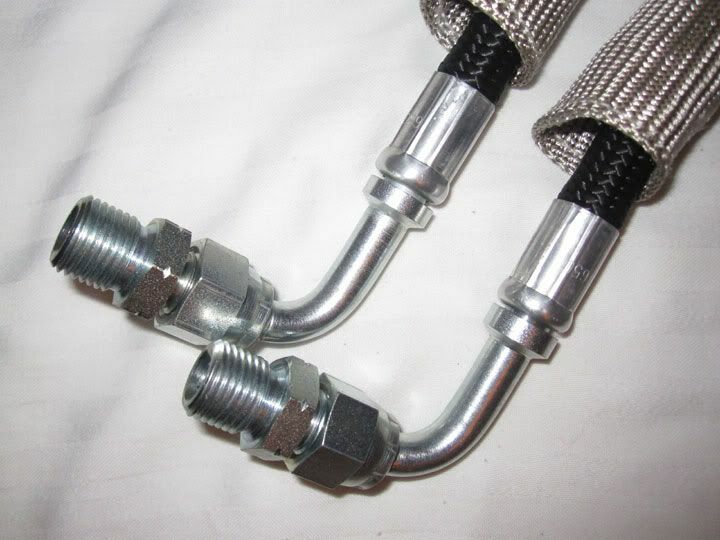 They are lighter than the stock hoses or comparable stainless braided hose. They are shorter than the stock set-up so the oil spends less time "in transit". They look darn good! A couple things to be aware of: These were originally designed because my stock cooler lines interfered with my hard pipes. 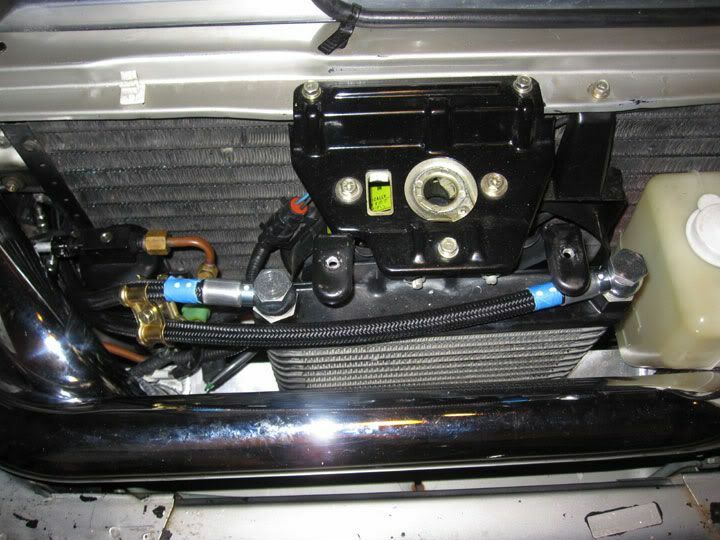 I have altered the radiator support minimally to accommodate the pipes and the lines fit without any pinching or other interference. I cant say 100% positively that these will fit a non-modified radiator support but, if not, it would require very little modification. I will provide better pics later this afternoon of exactly what I have altered on my rad support. 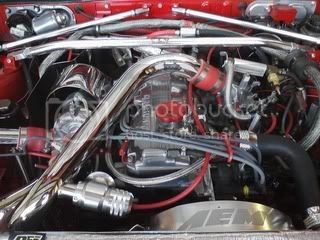 I plan on making matching hoses for the turbo coolant lines, the fuel filter to fuel rail hose and the fuel return hose. I have already made the last two and I'm trying to wrap up the coolant lines. I've also made a set of automatic transmission lines to go with an Earls cooler but that would only be on a case by case basis because there is quite a bit more involved with those. I will add pics and more information as it becomes available. As of now, I will not be making any hoses using steel braid since these are already offered by other members. Important details involving the first 5 sets of the oil cooler lines: I will give this one week(from 6/19-6/26) to gather interest. I will ask anyone (seriously) interested in the lines to make a $25 non-refundable deposit and collect the balance when the hoses are ready to ship. After closing interest next Sunday, I will decide on the amount of materials needed to be ordered and make the calls I need the following Monday. I will expect the materials to show in a weeks time. 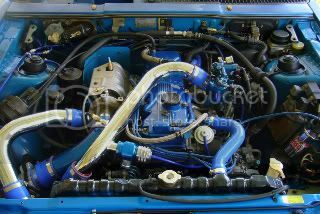 I will take the next week assembling the hoses and be shipping them out to who pays first starting the weekend of July 15th. A little about myself and why you should trust me with your hard earned $$: I have been a regular member here for over 5 years and have had many transactions with SQC members. All of which have gone successfully. I am personally acquainted with at least 3 long-standing local members who can vouch for me. My ebay account has 200+ positive feedback ratings. I really love these cars and would be proud to be able to produce a product people would like enough to grace their own car. PRICE: $175 for everything pictured shipped(lower 48 only) priority mail. Last but not least, the pics! 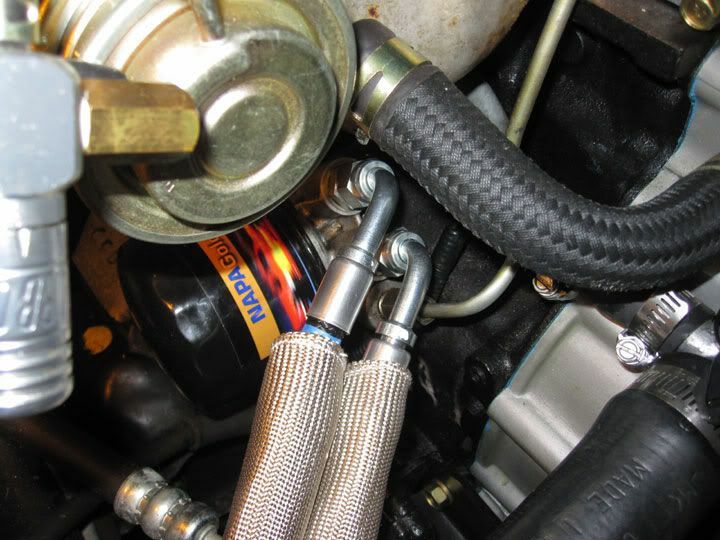 I need to get these crimped but here's the turbo coolant hoses. These will also include the correct size adapters also made of steel. They are -8 from start to finish. These will be $100 shipped. If you've read this far, please take a little time to leave me some feedback here or through a PM. Edited by 89PalermoSHP, 19 June 2011 - 05:36 PM. Dude, those look DAMN good. Unfortunately, all of my money is commited to one thing or another for the moment. wish i had the money ... would LOVE to do this.. Thanks everyone, I did my best. 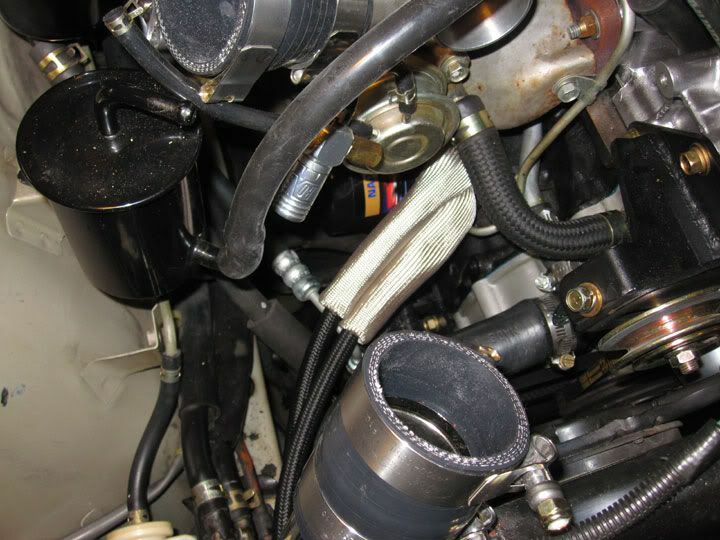 I have 1 set of the turbo coolant lines ready to ship if anyone likes. $100 shipped for everything needed to bolt on. Wait, i need a minute to wipe up my drool. Those are very beautiful and that's exactly what i wanna use on my quest since i'm not into all that shiny stuff. I will definitely keep an eye on this and try to be ready when u get going. Good luck! These are nice. 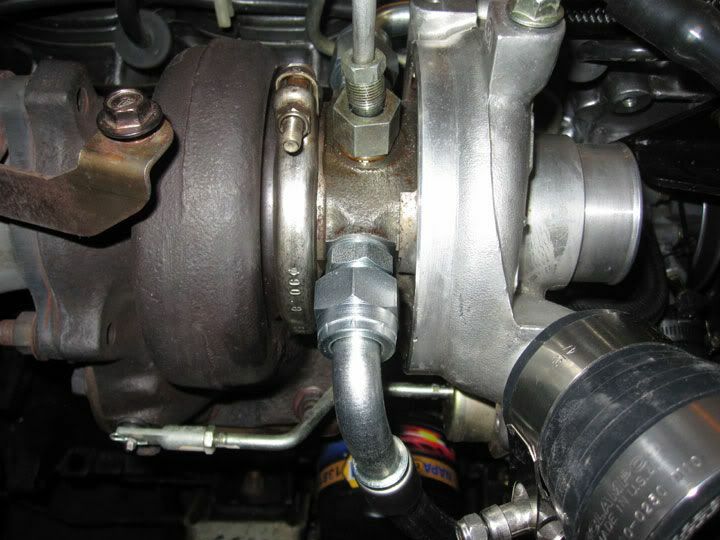 Are you able to make the oil feed line to the turbo? 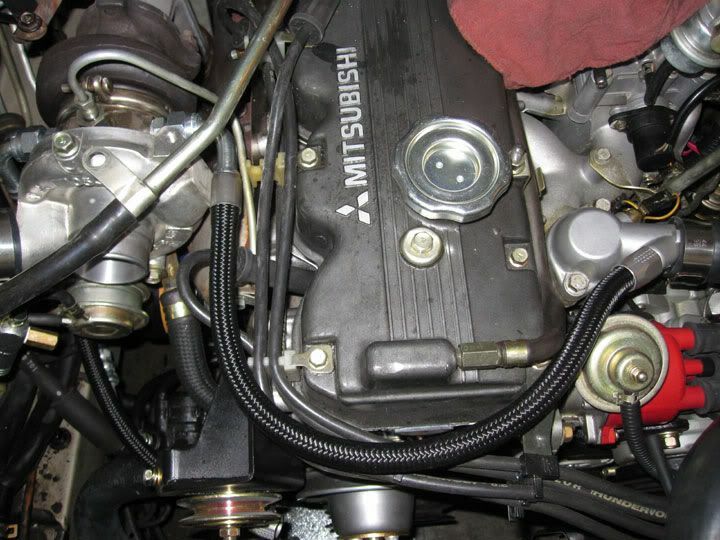 The line that goes from the top of the turbo down to wehre the oil filter sits? Are you asking about that line in general or that line in the black weave? Either way, I could make it but I haven't done any investigation about the size fittings required for the turbo or the filter housing. Ill look into it in a couple weeks. My transmission will be done this week and Ill be putting all my effort into getting that back together. Ill keep you posted. Keep the interest coming... if we have to wait more than a week it really not a big deal and probably for the best at this moment. I can do these at any time. I just thought it would be best to make them while my car is apart so I can be 100% sure everything fits like it should. I can always take the stuff apart again when and if this goes anywhere. Chasing ROUS in the Fire Swamp. The fittings are zinc plated. Not the yellow/gold zinc but clear/white. No other color for hose, sorry. 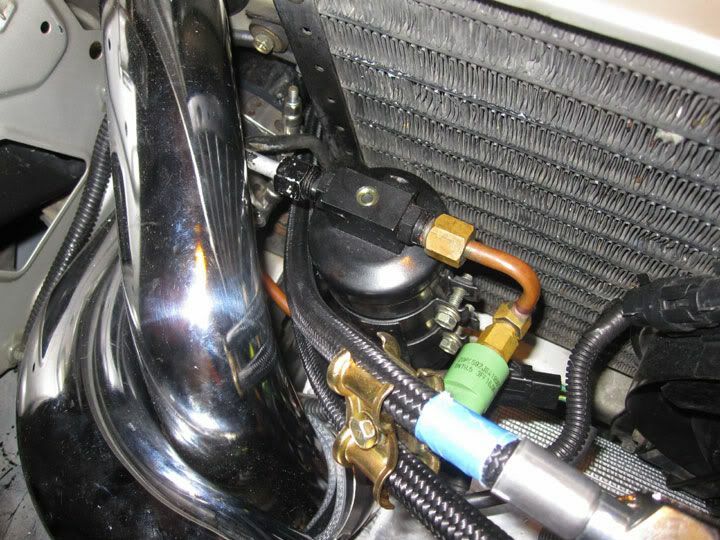 will turbo coolant hose fit under ovc pipe?top quality looking lines bro---colored sleeves? Yes it will fit under the ovcp. It runs the same way the spark plug wires do. I experimented with a clear heat shrink sleeve and it just didn't look very good. Ill be using it for my transmission lines but just for protection since they run underneath the car. Im not aware of any other colors for a quality shrinkable sleeve. If you have something in mind shoot me a link. 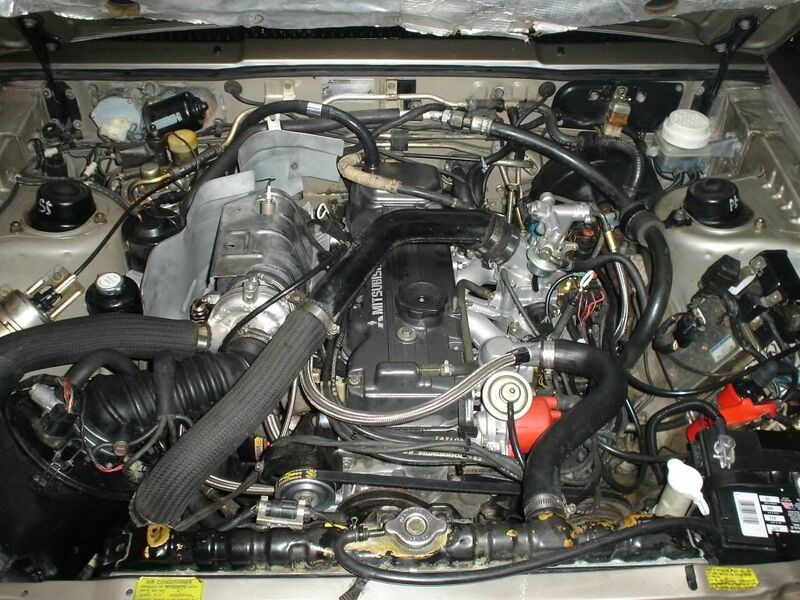 This is my car with the original ovcp. 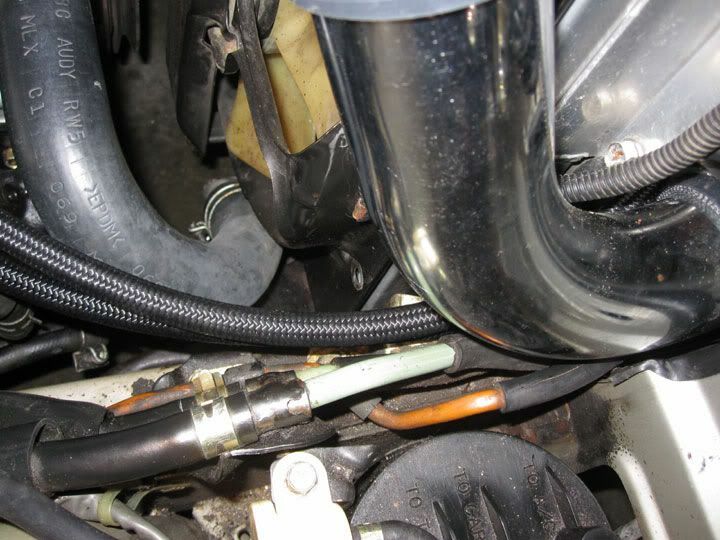 Its not the same coolant line but identical in fit. Edited by 89PalermoSHP, 21 June 2011 - 12:30 PM. No worries to anyone who might be interested and short on funds. This is something I can do at any time and in any quantity because I would probably have to buy huge amounts to get any real discount. I can also do something custom to your needs as well if you wanted different lengths or different ends. PM me at any time and Ill do my best to get what you want. Oh yes, I like this post. These have been added to my list when I pull the trigger on a buy. They look awesome! I would buy them but I have already started on the flashy steel braided look. Interests:I love cars, bmx, motocross.......anything with a motor and goes fast. Ill have to get back in the saddle. I haven't done much with these hoses since I made my set. If I can get a couple people interested Ill take my car apart again so I can make em. I have to see what stock I still have on hand as well. I think I have enough stuff for two sets of turbo coolant lines but I will have to order stuff for the oil lines. If your serious PM me and we can make arrangements. Edited by 89PalermoSHP, 16 December 2011 - 11:54 AM. Sweet, on my 'wish list' as well.